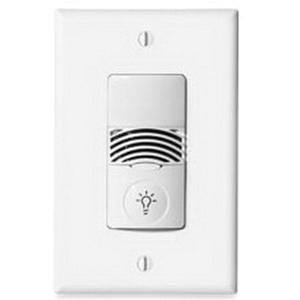 Cooper Industries NeoSwitch™ Greengate® Single-level occupancy sensor in white color, features passive infrared and ultrasonic technology. It has sensing distance of 1000-Sq-ft and 180-degree viewing angle. It features durable injection molded ABS resin. Sensor requires 120/277-Volts voltage for operation. It is suitable for private offices, small conference rooms, lunch/break rooms, individual restrooms and hotel guest bathrooms. Sensor measures 2.618-Inch x 1.752-Inch x 1.9-Inch. Sensor features air-gap switch that offers no leakage current to load. It has red LED for PIR detection and green LED for ultrasonic detection. It is wall mounted at height of 36-ft x 30 ft. Sensor operates at temperature of 0 to 40 deg C. Sensor is UL/cULus listed, RoHS/FCC compliant and meets NEMA standards.